When this book turned up, beautifully wrapped and with a complimentary book mar and a do not disturb sign I really wasn’t sure what to expect, and so with some trepidation I embarked on another psychological thriller, but this time there was a difference the most obvious being the setting. I’ve not read one yet based on a cruise ship. As a warning for any of you looking forward to a summer cruise, this book may well make you think again! This is an incredibly well-plotted tale with realistic and likeable characters, not for Catherine Ryan Howard the instant panic and breast-beating that weaker books indulge in, rather Adam behaves in a normal fashion, starting off by telling himself why everything is ok, getting a tad worried, becoming panicked and cycling between these states until revelations changes his view of their relationship entirely. In amongst Adam and Sarah’s story we witness life on a cruise ship as told through the eyes of one of Blue Wave’s employees, Corrine. Corrine cleans the cabins, makes friends with a new employee and shows us around the staff quarters. I’ve never been on a cruise ship but it all sounded totally authentic to me. The crew work hard to make the fortunate travellers have a good time, working around shortages and minor mishaps as many a service provider does the world over. We also hear from a young boy in 1990s France whose relationship with his mother is a little rocky to say the least. There is something very unsettling about these pages and their inclusion serves to enhance the already elastic-band-about-to-snap tension in the rest of the book. But the really scary bit is the way that crime on a cruise ship is managed based upon would you believe it nationality. The police force responsible for the ship is that in the jurisdiction its registered so our cruise-liner which makes trips between Barcelona and Nice in France is actually the responsibility of the police force of the Bahamas, unless, you happen to come from the US who have their own laws, then any serious crime is investigated by the FBI, fascinating stuff! What more can I say? The plot was excellent, the writing captivating and the characters realistic. There were a number of heart-breaking moments, a few of those wonderful ‘aha’ moments when bits of the puzzle slid into place and a smooth writing style full of suspense that urged me to keep turning those pages – a brilliant debut from an author I hope we hear a lot more from in the future! Innovative books are what we need and so despite the psychological thriller tag that I won’t repeat but gets added to many book titles these days, this was in fact something different, the type of read that simply can’t be compared to anything else! I’d like to thank the publishers Corvus for sending me a copy and this review is my unbiased thank you to them. 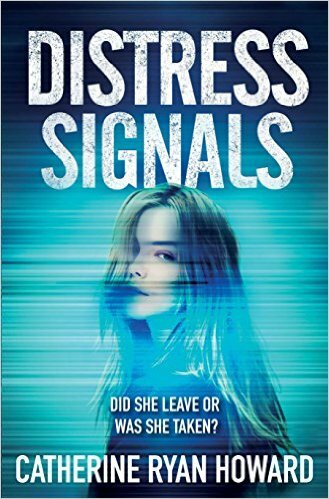 Distress Signals will be published on 5 May 2016 and look out that week as I have a special blog post for the blog tour. Great review as always. I really enjoyed this too. I certainly won’t be going on a cruise any time soon! Never a fan of cruises anyway, but I’m really looking forward to this one. I’ve pre-ordered it, as I’ve been following Catherine’s adventures in Disneyland, self-publishing and whatnot for quite a few years now. It was exceptionally good for a debut novel and I did like the alternative setting very much indeed. I hope you enjoy it when it arrives! Great to read such a positive review of Catherine’s novel, I’ve been on plenty cruises and always a mystery to me that all embarked return…well usually! Aw thank you! It does seem a high-risk was to holiday to me too now! Hi Cleo I have to read this. I keep telling my family cruises are not a good idea. Now, I only need to have them read this book and goodbye the cruise holiday, haha. Absoutely this will really knock that idea on the head! Oh, this does sound fascinating, Cleo! And I do like believable, well-drawn characters. And a cruise ship is such a great context for a crime novel, isn’t it? It’s interesting you would mention nationality. I did a course once in international law, and learned that things that happen on cruise ships make for some of the more complex sorts of cases. I had no idea about how law is applied to cruise ships – this aspect really appealed to the nerdish part of me and of course you are right, a fantastic setting for crime fiction! I’m always up for a thriller, and this one certainly sounds tempting. I thought I might have read something by this author, but I haven’t. I need to add this one to my list. Thanks for sharing. Thank you Laurel, funny you should say that as the name sounded familiar to me but this is her debut novel, and a very good one too I might say! I have pre-ordered my copy, can’t wait to read it now. I have been on cruises before but not in awhile, I can imagine this being quite paranoia scary 🙂 sounds amazing Cleo, definitely adding to TBR list. The thing about a crime on a cruise ship is that once the ship is at sea no one can get off …. After reading your fab review, I now have this book to read. Excellent news – thank you, I do hope you enjoy it!